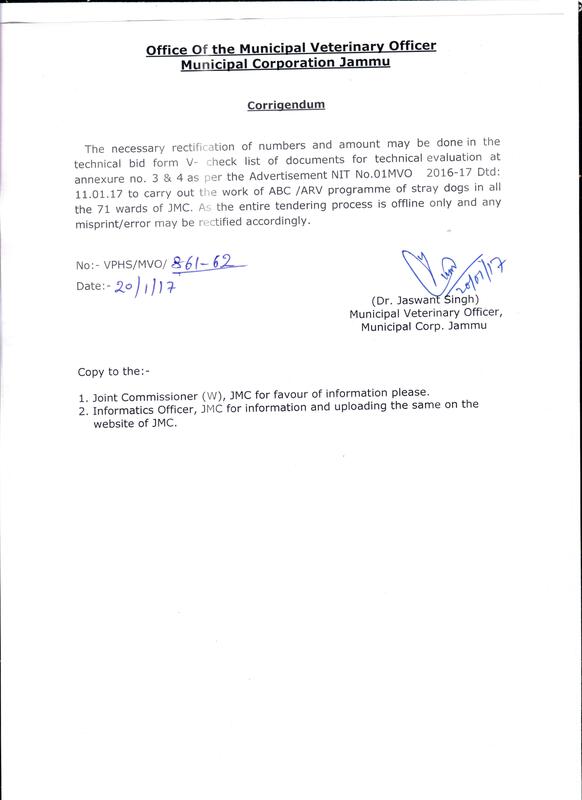 149 For submission of Tender: 20.05.2017 upto 02:00 PM Construction/Reconstruction of Lanes/Drains & other Allied works in JMC Ward No. 44 & Construction/Upgradation of Lane & Drain from Ravidass Mandir to Shiv Mandir Sec. 2 Gangyal Wrad No. 56. Tender No.MJ/Tech/T/625-32 Dt: 13-05-2017 vide e-NIT No. 436 bbt & 47 t.
150 For submission of Tender: 19.05.2017 upto 02:00 PM Upgradation/Construction/Renovation of Lane/Drain in W.No. 56 & 50 Tender No.MJ/Tech/T/339-46 Dt: 29-04-2017 vide e-NIT No. 23 t - 27 t.